Known as the Prikichi in Papiamentu, this beautiful and brilliant species of parakeet, Aratinga pertinax, is regularly seen perched on trees on Bonaire. There are 11 subspecies of Brown-throated parakeet endemic to South America and the Southern Caribbean. Bird lovers can identify the Prikichi by its yellow-green underbelly, bright green wings and back and brown-tinged throat plumage. 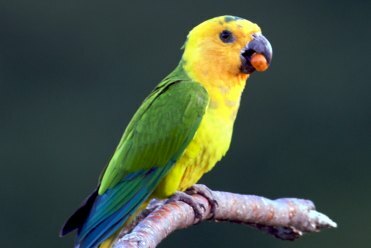 While the Prikichi is sometimes mistaken with the Yellow-Shouldered Amazon Parrot (Lora), it is smaller than the Lora, typically reaching 25cm in size; in addition, it lacks the red and blue wing feathers distinct to the Lora. The Prikichi is highly vocal bird with a range of sounds from repeated “cri-eek-cri-eek” in flight, a high-pitched tittering “cree-cree, cree-cree” song to and chattering when at rest. It lives in a variety of habitats from mangroves to savannahs, arid shrubland to wooded urban parks, from sea level to 1,000 m elevation. They are social birds, normally spotted in pairs of small groups, though they sometimes roost in larger communal groups. They breed between February and September, typically nesting in sheltered tree cavities. Females typically lay 3-6 eggs, which they incubate for a little over 3 weeks. Chicks typically fledge within two months, though they sometimes remain with their parents or in small groups. The male feeds the fledglings while the female incubates the next clutch. They feed on a variety of fruits, flowers and seeds. Enjoy your birding adventure with the beautiful Prikichi!